Committees form the backbone of our congregational life. The Unitarian Church of Staten Island could not fulfill its mission and purpose without them. You are warmly invited to participate in the committees, except as noted. For information about a committee and how to become a member, or to express a concern in a particular committee's area of interest, please contact us. Makes recommendations for improvements and repairs to the interior spaces of the UCSI, including flooring, walls, fixtures and shelving. BLM committee brief description to come. Provides support at times of need and transition, such as adoption, birth, death, illness or moving. The CoSM focuses on all aspects of the congregation's ministry: professional and lay leadership, music, social justice, religious education, pastoral care. The other committees are involved with parts of the ministry, i.e. finances, buildings and various programs. CoSM is purposed with taking in the big picture. Ensures the flow of communication among the congregation, Trustees, Minister and the greater community, through the press, web and social networks. Maintains church property to assure safety, cleanliness and code compliance. Coordinates the business operations of the church to ensure fiscal integrity, effective use of personnel and inter-committee fiscal cooperation. The Flower Committee provides flower arrangements for the Sunday services, with special flowers at Christmas, Easter and at memorials on request. The Hospitality Committee arranges for availability of refreshments after the Sunday service. The Membership Committee welcomes visitors to our church and its programs and keeps members engaged. This committee administers the Memorial Garden. Supports special music programs and maintenance of church instruments. Researches and proposes candidates for open positions on the Board of Directors. Works closely with minister and music director to ensure the Sunday service meets the needs of the congregation. Fundraising event organized by the Men's Group. Spring fundraising event to benefit the Religious Exploration program. Dinner themes have included Irish Pub Night and a Pasta Dinner Extravaganza. This is an interfaith celebration of freedom based on the Jewish Passover Seder. Through ritual, stories, and music, we learn about each other's cultures and express our yearning for the liberation of all people throughout the world. The Seder is both a service and a shared meal. SUMMER: Member-Hosted Benefit Dinners Member-hosted benefit dinners are held over the months of June, July and August, in members' homes. ​Yearly Summer Sunday Service Program from June through August. 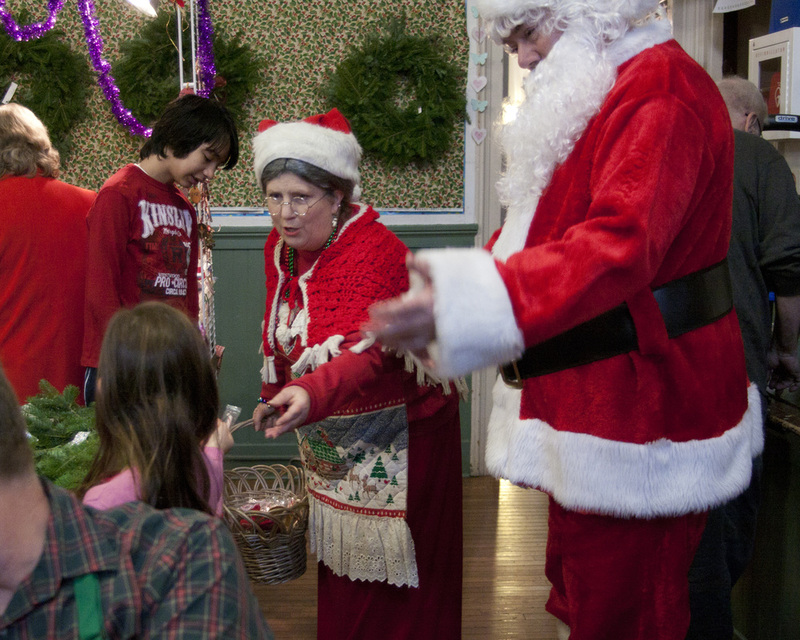 UCSI member Vivian Vassar in Mrs. Claus disguise. The Jolly Holly Fair Committee plans and holds the yearly seasonal fair, a major fundraising event coordinated with other neighborhood arts and cultural events.